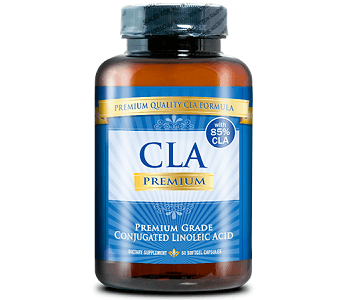 CLA (Conjugated Linoleic Acid) is a popular weight loss supplement that is known to reduce fat while increasing muscle mass. CLA is naturally found in dairy and meat, but in lower levels than what you can find in supplements. These foods are also higher in saturated fat. CLA is made from linoleic acid that is found in high amounts in sunflower and safflower oil. Research has shown that a supplement should contain at least 80% CLA to be beneficial. 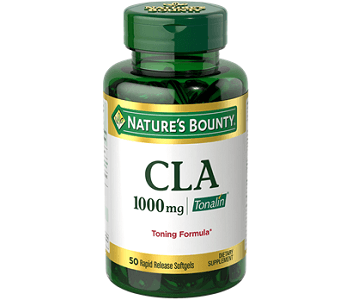 This review will examine one CLA product on the market called Nature’s Bounty CLA to see if it is worth your time and money. This product derives its CLA from safflower oil and is contained in a rapid-release capsule for faster absorption. The manufacturer states that these capsules should be used in conjunction with a healthy diet and exercise for best results. The only main ingredient found in this product is 2000mg of Tonalin CLA from safflower oil. It contains 78-84% CLA. Linoleic acid is an omega-6 fatty acid found in vegetable oils. The arrangement of the double bonds in these fatty acids are changed which then gives us CLA. So, basically, CLA is a healthy trans fat. CLA includes benefits such as increased fat burning and reduced food intake. CLA is also known to increase muscle mass. It is a little concerning that there is not an exact percentage of CLA contained in this supplement. This may indicate that the product is not consistently made. The manufacturer recommends taking three capsules a day. It is advised to take two softgels in the morning and one softgel in the afternoon and these should be taken with food. This product is only for adults. The manufacturer advises pregnant and nursing women and individuals with any medical conditions or taking medications to consult a doctor before taking this supplement. Nature’s Bounty does not sell this product directly but they have a tool on their website for you to find a retailer. This CLA product is available in both online and physical stores. The price online seems to range from $11 to $18. Any special offers and deals will depend on the retailer where you are buying the product. Nature’s Bounty does not seem to offer any sort of guarantee with their product. This is disappointing because if the product does not work for you, you will have no way of getting your money back. We found very mixed user reviews for this product. This seems to be a decent product for losing weight. The main concern about the ingredients is the inconsistency regarding the percentage of the CLA found in the product. It may mean that the product will not always be so effective. Judging by the user reviews, this product does not work for everyone. The lack of guarantee means that if you are one of those people who the product does not work for, you will have no recourse to get your money back. There are other products on the market that are effective and also come backed by satisfaction guarantees.